The beauty, the arts and culture have been always remained a priority for East, inspiring the rest of the world in different areas, especially in fashion. The long-awaited Fashion Week dedicated to the Parisian Haute Couture took its place this summer from 3d to 7th July 2016. 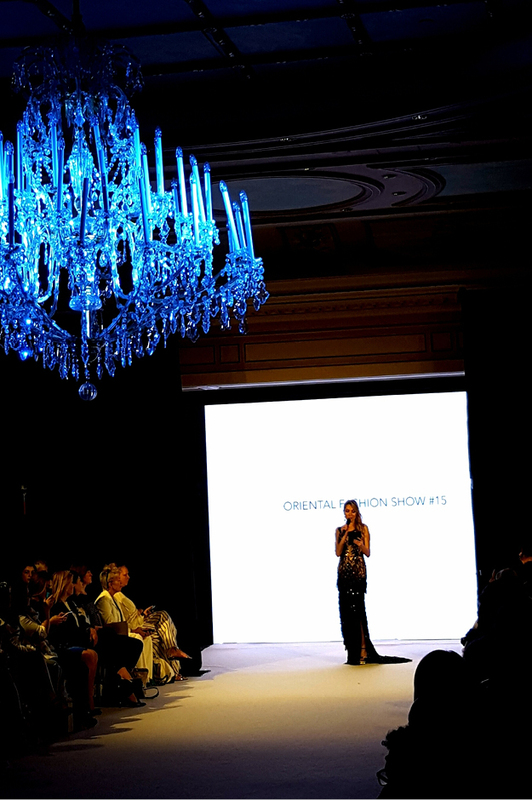 On such special occasion, July 7th, the 15th edition of the Oriental Fashion Show coincided with the weeklong fashion show took place in the glorious Four Seasons George V Paris Hotel. It has enhanced the various facets of Oriental fashion by carrying out the fusion esthetic of international dimension through dress collections tinged with tradition and modernity. Interview of Elisabeth Visoanska by the Oriental Fashion Show. During this great event, Elisabeth Visoanska, as the master of the ceremony, successfully hosted the entire show and emphasized the strong bonding commitment values of the partnership project. She introduced 4 fashion designers who are involved in the development of the Oriental Fashion’s new image through their work and talent. The whole event revealed designers’ boundless artistic potential trough that they have been able to transform the Oriental Haute Couture into the fields of expression, rich in meaning and beauty. In the back stage, Visoanska, haute cosmetic, offered the star set of three premium products (shown in below) to sublime the flawless runway look of the models. The French model Marie-Belle (@mariebelleofficiel) on backstage with our beauty essence, Source Première. Source Première: the beauty essence with prodigious efficiency and an optimal tolerance for both the face and the eyes, frees the skin from the impurities and the makeup, restores and durably protects the integrity of the cutaneous ecosystem. Elixir Perfecteur: this high-precision concentrate helps accelerate cutaneous regeneration and renewal. As the age is growing, cellular reparation weakens and certain residual marks caused by cutaneous lesions remain visible. For more inofrmation about the show, click here.